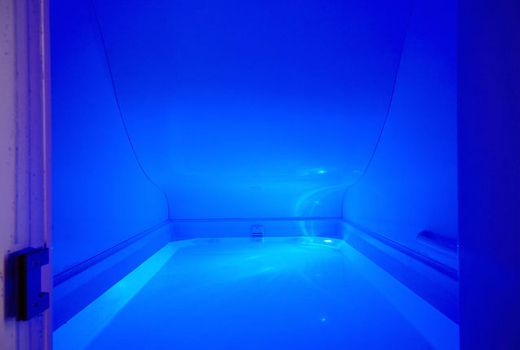 Classically known as sensory deprivation, float therapy relieves the senses and stills the mind. Floating is therapeutic to sore muscles, joint inflammation and high blood pressure. The zero-gravity environment is a powerful tool for wellness, relaxation, pain relief and better sleep. Regular use enhances the healing process. Stress, tension and pain have formed over time and will take some time to experience the greatest relief—luckily, floating is a relaxing, fun,and effortless way to do so! The room is large enough for a couple to float in 10-inches of water with 1300 pounds of Epsom salts creating a buoyant environment that negates the pull of gravity on our muscles and joints. The salts will release muscle tension, pain and lower blood pressure just by floating. The air and water are controlled at 94 degrees to contribute to the unique sensation of floating when our sensory receptors in our skin lose where the water ends and the air begins. Choose to experience sensory deprivation by going dark and soundless while floating or enjoy the ambient light and pipe in calm music of your choice from your device.